The following mostly refers to the male (Winchurch) line of my family. addition to the Browns) – Sternberg, Plucknett and other related families in Devon and Northampton. Much of the material used here was originally researched by my father, the late Francis Victor Winchurch. Thanks also to Jeremy Ward and Sheila Williams for their assistance and input to this project. A word of caution at the outset. I maintain an open mind with regard to all information not directly verifiable and welcome any new input or corrections from any reader or source. The name Winchurch, or Winchurst, or Winsthurst is believed to be Saxon in origin. Until about 1740 ‘Winchurst’ was the most common spelling by far. The earliest records are from Dudley, Rowley Regis and Walsall in the West Midlands of England and some around Stepney in London, although the latter are almost certainly those of families who moved across the country manufacturing and selling iron goods, produced initially around Dudley. The Winchurchs were involved in the beginnings of the Industrial Revolution, in what became known as the ‘Black Country’, to the North West of Birmingham. The family members’ primary occupation up to the late eighteenth century was nailmaking. They moved to glass manufacture and coal mining in the early eighteen hundreds with my great great grandfather, Thomas Winchurch, a glassblower, moving from Dudley to Aston, North Birmingham in 1821. In all probability the newly constructed canal system through the Midlands played a major part in this. My own branch of the family lived and worked with Birmingham as a hub until about thirty years ago. In fact I worked within walking distance of Aston whilst based at the ATV Television studios in the 1970s. STAFFORDSHIRE. Inquisition. Lichfield. 6 April 1434. [Coton]. No. 63. At a month from Easter Day.37 Hen. VI. Between Thomas Everdon and John Tylney, complainants, and William Wynneshurst, the elder, and Katherine his wife, deforciants of three messuages, two tofts, 140 acres of land, and nine acres of meadow in Bisshebury. ¶William and Katherine acknowledged the said tenements to be the right of the complainants, for which they granted them to William and Katherine for their lives, with remainder to William Wynneshurst, the younger, and his issue; and failing such issue to John Wynneshurst, brother of William and his issue, and failing such issue to Richard Wynneshurst, brother of John, and his issue, and failing such issue, to the right heirs of Katherine for ever. bad made no return to the writ up to Easter term, 29 H. VI. m. 347. I have copies of both this document, in Latin, and an associated document transferring a ‘parcel of land’ in Smythylone. A ‘Messuage’ was a dwelling. The very helpful notes supplied with the copies by Dudley Archive and Local History Service and written by N.W.Alcock, add that a medieval ‘Gift’ is not as we understand it today, but was in effect a ‘sale’ although the sum involved was often (as in this case) not specified. Duddeley is derived, it is believed, from ‘Dudda’s Leah’ (a Leah being a clearing in a wood). Wood was vital to iron smelting until Dud Dudley, Abraham Darby etc developed the coke process. The insatiable demand for wood and resulting large scale felling over a number of centuries led directly to their experiments. If Dudda had a Leah, it seems very likely that Wyn(ne) could have had a ‘Hurst’ or clump of trees. And taking this wild speculation a step further, the last Saxon Lord of Duddeley ( when it was still a village, remember) was Edwin…..
Maybe ‘EadWinsHurst’ was where Edwin settled when evicted from the site of the future Dudley Castle by his Norman successor. It is possible that the Winchursts arrived in the Dudley area when the Saxons arrived from North Germany around 700 AD. Since I first wrote the above, I have read Stephen Oppenheimer’s fascinating book ‘The Origins of the British’ and am now convinced that the ‘Saxon Invasion’ may well be a Victorian myth. My Winchurst ancestors could have been in England before the Romans came. ‘More on that developing story later’ as Kirsty Wark might say ! The first mention of a castle at Dudley comes with the arrival of “a great and powerful prince of the Kingdom of Mercia” called Dudd, Dodo or Dudo circa 700 A.D. “who raised a strong fortress here, which remained until the Conquest.” Add the suffix “ley” or “lea” (which means land) to the man’s name and you get the likely origin of the area’s name. There is also a claim that someone called Athelstan (not the king of that name) might have been responsible for the castle, but the weight of preference lies with Dudd. When William the Conqueror crossed the English Channel and defeated Harold in 1066, he distributed the spoils of victory among those who had supported him. One of these was Ansculf from a village near Amiens, who was assigned a barony of more than 80 manors scattered across several counties. This fragmentation was William’s deliberate policy to prevent his gifts being turned into mini-states to continue the pattern of feuding then found in France. In his collection, Ansculf was awarded Dudley and recognised that its hilltop site was ideal for Norman-style fortifications. At that point the Saxon fortress was held by Edwin, possibly a grandson of Leofric, Earl of Mercia, but the Conquest meant that Ansculf could simply dispossess him. Winch als. Winchurst, Humphrey, Dudley, Worcs. To Geo. W. als. W., k., dur. min. Jn., Isabel & Cath. W. als. W., chn., Nov 1605 , p. 23. On the 26th day there was issued a commission to George Winch alias Winshurst, kinsman of Humphrey Winch alias Winshurst, late of Dudley in the county of Worcestershire, deceased, having, etc, having been sworn to administer the goods, rights and credits of the said deceased well, etc, during the minority of John, Isabel and Catherine Winch alias Winshurst, children of the said deceased. To Isabel W. als. W., rel. (by Decree), Jul 1606 , p. 46. On the first day there was issued a commission to Isabel Winche alias Winchurste, relict of Humphrey Winche alias Winchurste of Dudly in the county of Worcestershire, deceased, having, etc, having been sworn to administer the goods, rights and credits of the said deceased well, etc. February 1606 [a decree] is taken for the portions of the children. There is interposed a decree concerning the distribution of the goods. So, it seems that earlier records in Dudley of ‘Winsts’ may be the same family. Why ? My own guess was that there is some connection with ‘Hurst Hill’ in Dudley and that Humphrey Winst added his place of residence to his surname, however with the discovery of the earlier references to ‘Wynneshurst’ noted above the story may be more complicated! If indeed, the earlier records of Winsts are relevant, then the earliest is that of ‘Thomas, son of Jhon’ (sic) Winst baptised on 21 September 1549 at St Thomas Dudley. Thomas died soon after in infancy, being buried on 3 October at the same church. ‘Jhon’ then has five further children between 1553 and 1562 with baptisms sometimes at St Thomas, sometimes St Edmunds. The spelling of his Christian name changes to the more familiar ‘John’ for some of these entries. This may well be the ‘Humphrey Winchurst, alias Winch’ mentioned above, who died in 1605. His age would have been 45 and this would fit with having ‘minor’ children. I like that !..somehow it turns a name into a real person. The Winchurst family, with all its spelling variants, was deeply involved in the iron founding which had started in Dudley in the thirteenth century. Initially, charcoal was used for the smelting process, but stripping of the native woodlands hastened the search for an alternative process. The use of coal for this is well documented see, for example http://www.blackcountrysociety.co.uk/articles/duddudley.htm , one of the Black Country Society’s many interesting features on the history of the area. William Wynneshurst’s location in Smythylone (Smithy Lane) also suggests connections with iron as early as the 1460s. Eldest son William, son Robert dau Susanna Dalton w of James. Edward and Sarah Lullidge children of dau Elizabeth Lullidge wid. The Winchursts were probably making nails before the 1600s and an interesting link was forged with Stepney on the Thames in the heart of London’s expanding docklands. 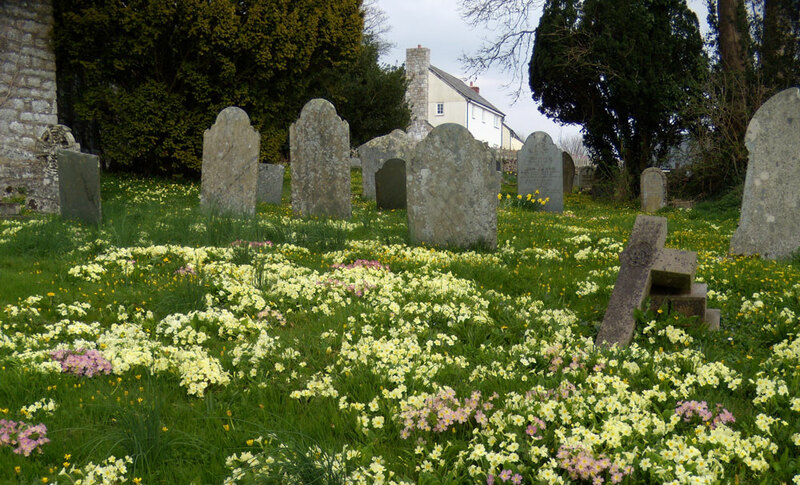 There is a registered burial of ‘Winchurst J” at St Walbroke in 1588. I have not yet managed to link this with any birth, either in London or the Midlands. It might be an infant son of John Winchurst, but that is only a guess. It looks as though the Winchursts were taking iron goods (probably nails) as the Tudor ship building expansion took place in London. Jeffrey Winchurst, set up a smithying business which specialised in the manufacture of anchors – an Anchorsmith. Jeffrey seems to have prospered and maintained his links with the Black Country, presumably at least in part because of his need of a ready source of iron and coal. He was named as an executor of the will of Robert Winchurst of Stourbridge, an Ironmonger, who died in 1661 and several legal cases arising out of the contents of that will. I do not have all of the archive records yet, but my father transcribed some and listed the PRO – now National Archive references. Six Chancery Proceedings resulting from the will of Robert Winchurst indicate that the acquisition of wealth by this branch of the family was not without its problems ! The National Record Office has the will of Jeffery Winchurst, Anchorsmith of Ratcliffe London. Jeffery was born in about 1611, probably in Rowley Regis or Dudley. I haven’t yet found a record of a birth anywhere that corresponds. I have a suspicion, in view of his date of birth, that he might have been the son of John Winchurst, who married Christian Bate in Rowley Regis in 1608. The parish records of Saint Giles Cripplegate, London have an entry for the birth of Tho, son of Tho Winchurst, baptised on 14 NOV 1650. This is transcribed in the International Genealogical Index (IGI), but as so often happens with the IGI’s transcriptions, an important snippet is not included. Fortunately Francis Victor Winchurch added the significant occupation – NAILER. This Thomas might well be the son of Jeffrey, baptised in Rowley Regis in 1625. Notice the recurrence of christian names in the Midlands and London. In the same row of buildings : Richard Folly for a warehouse £4. Is this John Winchurst Jeffrey’s father? (perhaps most likely, John would have been in his fifties) or brother. There is John Winchurst who is possibly my direct ancestor (and that of most Winchurchs), buried in Dudley in 1653, who married Christian Bate in Rowley Regis in 1608. Jeffery’s will also confirms the status of John Winchurst as his eldest son, who took over the business of Anchorsmith. Again, this suggests the continuation of a family name, albeit a common one. I give and bequeath unto my sons in law Edward Walker, George Tyte and Anthony Foster twenty shillings a piece to buy each of them a fine item. I give and bequeath unto my wife’s sonn Charles Harris to buy him a fine item. I give and bequeath unto my daughters Susanna Walker and Miriam Foster the sum of five pounds apiece. I give and bequeath unto Mary Robbinson ? the ?? ?which I ?? ?the sum of five pounds. By contrast, when Jeffery’s widow Elizabeth made her will in 1688, there was no mention of the Winchursts. A large part of the administration and proceeds went to Elizabeth’s maid ! I am not yet sure about the details of what seems to be two families in London at this time, Jeffery’s above and Thomas’s who was contemporary and probably a cousin. example of the link between the two locations. Thomas Winchurst. Details concerning Robert Foley’s supply of ironmongery to Chatham. Foley will keep on his own hands all such produced but not contracted for. Gives a list of this. The principal members were Richard Foley (1588 – 1657) (see connection with John Winchurst, above), Thomas Foley (1616 – 1677), Robert Foley (1627 – 1677) Paul Foley (1650 – 1699) and Philip Foley (1653 – 1716). 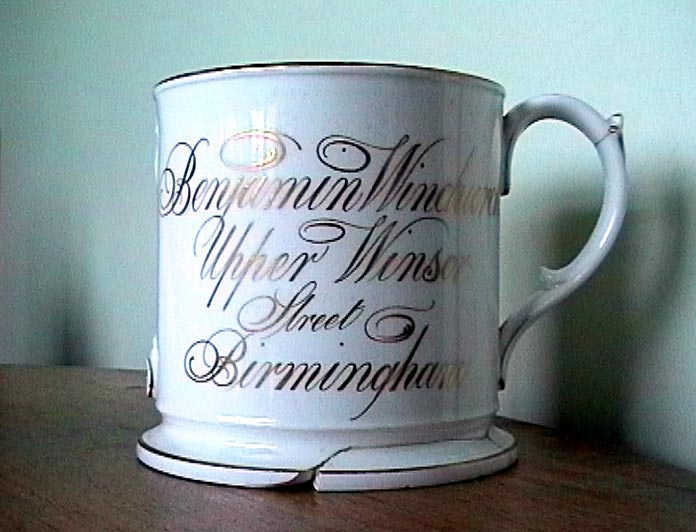 This provides more evidence of the continued link that the Winchursts maintained with their Black Country roots. It is fascinating to reflect that these people were living and working in a place and time which saw the rise of England’s naval power, the English Civil War and later the Great Fire of London and the Plague of 1666. John Winchurst, who continued the Anchorsmith tradition started by Jeffery, had married Frances Vavasor on 28 June 1664. Frances seems to have come from a landowning family in Yorkshire. There is a record of one of John and Frances’s children being christened as ‘Maior Winchurst’ which seems to have been a traditional name in her family. There are also records of Vavasor involvement in the Civil War on the parliamentary side, which may be why the family moved to London. After Frances’s death, John married Rachel Doorset on 16 June 1680, but there is no record of children from this marriage. Whilst Jeffery continued the iron founding tradition of the Winchursts as an Anchorsmith, Thomas began trading as a draper in addition to his ironmongery and evidently did well. 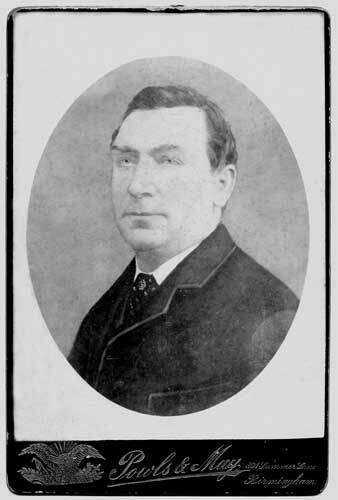 Robert Foley. Having been warranted to deliver ironwork to all dockyards except Portsmouth, having taken over his late father’s business, he appoints Thomas Winchurst to look after his business in his absence. Witnesses Wm. Warren, W. Barbour and Dennis Lyddall. 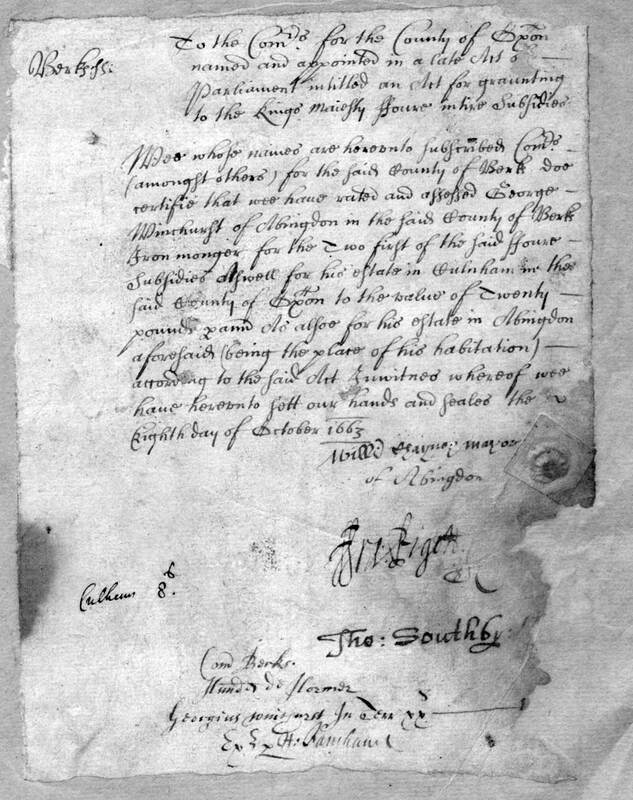 A will of Thomas Winchurst junr prepared in 1699 anticipated what seems to have been an early death in 1701. Thomas junr was about to depart on a journey to India with goods to the value of three hundred pounds, but he appears not to have returned from this voyage. He left a widow Phebe and children, Thomas, Jane and Phebe. Thomas was apprenticed George North of London Gent, for £107-10s by his uncle William Winshurst of London, marriner in 1712. Jane Winchurst dau of Thomas of St Giles Cripplegate was apprenticed to Thos Chamberlain of London for £20 in 1712. Johnson Burdet , and Thomas Winchurst , of the Parish of St. Giles in the Fields , Gentlemen , were indicted, the former for an Assault and Murder committed on the Body of Robert Faulkner , Esq ; on the 30th of December last, by giving him a Mortal Wound with a Sword value 5 s. on the Right side of his Body, near the Right Pap, of the Breadth of half an Inch and the Depth of 12 Inches, of which he instantly died: And the latter for an Assault and Aiding and Abetting in that Murder . Thomas Winchurst was hanged at Tyburn on 2 February 1717. Thomas Winchurst of London (the grandfather) had died in 1701 or, to be more accurate, his will was proved on 2 June 1701. He left goods and money to his son William Winchurst and to three grandchildren, including the ill fated Thomas. William, in turn died in 1707 and much of the proceeds of his estate passed to Thomas too. No wonder he was described as ‘gent’ at his trial. Assuming that he was born about 1695, he was 22 when he was hanged and Thomas Winchurst’s male line seems to have ended, leaving Jeffery’s sons viz John, Jeffery and Charles to provide future Winchursts in and around London. Anchorsmith Jeffery was George’s brother and Robert’s uncle (and later his executor). George’s youngest son George settled in Abingdon. He opened ironmongers shops in Oxford, Abingdon, Henley on Thames, Windsor and Guildford. I suspect Robert, Jeffery and George arranged deliveries of pig iron and goods across country and then via the Thames. This route is an obvious choice if one looks at a map of southern England and the removes the roads ! To the Comrs for the County of Oxon named and appointed in a late Act of Parliament intitled in an Act for granting to the King’s Majesty ffoure subsidies. Wee whose names are hereunto subscribed Commrs (amongst others) for the said County of Berks doe certify that we have rated and assessed George Winchurst in the said County of Berks, Ironmonger, two first of the said ffour subsidies as well as for his estate Culsham in the said county of Oxon to the value of twenty pounds paid. George of Abingdon prospered too and apparently became mayor of the ancient town. His son John, born in 1653, entered Pembroke College Oxford on 17 December 1669 at the age of 16. Gaining his BA in 1673, he became a Fellow and his M. A. followed in 1676. After short period in Devon he became Vicar of Radley in Oxfordshire until his early death in 1682 at the age of 29. John was buried in Radley church on 14 September 1682. Saturday at night (14 September 1682) died at Radley Mr. John Winchurst, M. A. and fellow of Pern. coll. and vicar of , at Radley buried in the church 14, a good scholar, of a subtil head, a good mathematician, bom at Abcndon, his father was a malster and mayor. Robert Winchurst and his brother William built up iron based manufacturing and trading around Stourbridge. Both brothers made considerable fortunes as a result and the wills of both were the subject of bitter court cases when distribution of money and goods were contested. As previously mentioned, ‘Jeffery Winchurst of London’ was an executor of the will of Robert Winchurst and is named in the ensuing court case between Robert’s daughter and her mother! In another proceeding in the Court of Chancery in 1670, Jeffery of Ratcliffe’s (London) daughter, Susanna and her husband Edward Walker and others were in dispute with Robert’s widow Joan about his will. By this time Jeffery was dead as well as Robert, so the Stourbridge – London link continued, in the courts at least ! To the right Honourable Sir Orlando Bridgeman. Knight and Baron, Lord Keeper of the Great Seal of England. Andrew Muchall of Stourbridge in the County of Worcester, Ironmonger and Mary, his wife one of the daughters of Robert Winchurst, late of Stourbridge in the County of Worcester, Ironmonger, now deceased. That wheras the said Robert Winchurst in his lifetime was possessed of and in a very great personall (?) estate consisting in ready money, goods, wares, merchandizes, household stuff and other things of divers sorts and kindes to the value of two thousand and five hundred pounds and upwards and being so possessed he, the said Robert Winchurst made his last will and testament in writing, bearing date on or about the eighteenth day of March in the year of our Lord one thousand six hundred and sixty (1660) and by his said will did declare that forasmuch as he had bestowed three hundred pounds at the least, in the new building and replacing of the mesuage, lands and tenements in Stourbridge aforesaid, which were the inheritance of Joan his wife and thereby had much improved the yearly value thereof he did thereby desire that she would accept thereof with such additions as were thereby bequeathed for her livelyhood and that she should permitt the same after her decease to descend to the heirs of his body, of the body of his said wife, begotten and to be begotten and that she within sixteen weeks most after his decease should suffer a fine to be acknowledged of all the said mesuages, lands and tenements to the (heirs?) aforesaid and that she should not do, commit or suffer anything to alter. change. discontinue or divert the same which if she should not do (but ?…………) then and not otherwise he bequeathed his estate to his said wife during her widowhood only, the sum of six pounds yearly to be paid her by his executors by the lease or interest of one hundred pounds to be raised out of his personal estate and to be set for that purpose to that purpose. And thereby appointed that such goods of Amy Baker late mother of his said wife which were by her given or bequeathed to his children should be delivered and disposed of accordingly and her will in that behalf duely performed and willed that his said wife should have the use of all the rest of his household goods during her life and after her death he bequeathed the same to be equally divided amongst all his children or to such of them as his said wife should in her life or by her last will and testament give and bequeath the same and further thereby appointed that within six months next after his decease his executors should make or cause to be made a tree (?) & summary indented of all his goods, chattels, debts , personal estate whatsoever, which should any way come to their hands, possession or knowledge and of the values thereof and should deliver one part thereof to the overseers of his said will or one of them and should manage, employ and dispose of the same for payment of his debts and legacies and otherwise as was therby expressed, that is to say just care of his personal estate ?????? increase ???????? ?should yearly pay for or towards(?) ????? ?of his three daughters the sum of ten pounds (?) until their several and respective marriages or age of one and twenty years which should first happen and that his said wife should have the education of his said daughters during(?) her widowhood and have and receive ten pounds ???? ?or towards the same. And that after her decease or marriage with any other husband the said daughters should be educated and maintained by such person or persons as his executors should appoint and find most fitting and convenient. And after his debts should be fully paid and his legacies satisfied he bequeathed the residue of his estate to his three daughters your Oratrix Mary and Joane and Sarah Winchurst by equal portions and willed that the portions paid to your Oratrix and his said other daughters should be paid unto them as they should personally and respectively accomplish their ages of one and twenty years or be married with the consent of his said wife and executors or the major part of them under their hands and seals testifying the same and if any or either of his said daughters shall decease before they receive their said legacies, having no children that then the legacies or portion so to her or to them bequeathed or so much thereof as should remain unpaid shall be paid or distributed to the other surviving and in the said will there is a clause to this effect that if any of his said daughters should marry without such consent that his said executors should ? and keep? the portion of her and them so marrying without such consent and of her and their children as his executors should find most fitting and convenient and made his BROTHER George Winchurst and his BROTHERS IN LAW Humphrey Jeston, Richard Walden and Jeffrey Winchurst of London his executors of his said will whom he required once in every year after his decease to give and make to his overseers or one of them a full and true account in writing under their hands of all their receipts disbursements and charges expenses and payments in any sort touching or concerning his estate or the execution of his said will and appointed that his executors should be repaid their charges and expenses and travel which they should be put unto by reason of his said will out of his said estate and give his said executors fourty shillings apiece and appointed Joshua Newborough (see also ‘Charities’ on http://www.british-history.ac.uk/report.aspx?compid=43093)and Nicholas Bradley of London Anchor Smith to be overseers of his said will and to receive of his said Executors one part of the said inventory and the accounts of his said Executors and give unto each of his said overseers forty shillings desiring their assistance to his said executors towards the due execution of the said will as cause should require and by his said will further appointed that if his said three daughters or any or either of them should have need or occasion for any manner of decent clothing and apparel or in respect of their respective marriage or marriages that his said executors should have authority to buy and provide the same for them and the money disbursed to be defaulted out of their portions and appointed his said executors to pay to his said wife fifteen pounds within a week next after his decease towards the maintainence of the said children in part of the yearly sum of ten pounds apiece thereby appointed for the education of his said three children as in and by the said will if your Orator and Oratrix had the same to produce more fully would appeare and your Orator and Oratrix further show unto your good Lordship that shortly after the making of the said will the said Robert Winchurch dyed possessed of such personal estate to the value of two thousand and five hundred pounds as aforesaid after whose death the said George Winchurst and Humfrey Jeston and Robert (Richard?) Waldron three of the executors named in the said will proved the said will of the said Robert Winchurst and tooke upon then the burthen of the execution thereof and by virtue thereof possessed themselves of all and singular the personal estate of the said Testator to the value aforesaid but the said Jeffery Winchurst the other executor named in the will refused to make probate thereof or to intermeddle (?) therewith and your said Orator and Oratrix further show unto your Lordship that upon the two and twentieth day of August in the year of our Lord one thousand six hundred and sixty eight (1668) a marriage was had and solemnised between your said Orator and Oratrix according to the ecclesiastical laws of this land and that your said Oratrix Mary attained her full age of one and twenty years on the twentieth day of May in the year of our Lord one thousand six hundred and sixty nine (1669) by means whereof your said Orator and Oratrix are entitled to have and receive one full third part of all the personal estate of Robert Winchurst after his debts and his other legacies are satisfied and your Orators do further show that one Amy Baker widow, the late grandmother of your Oratrix on or about the tenth day of May Anno Dom one thousand six hundred and fifty three (1653) made her last will and testament in writing of which will she made your Oratrix , her said late father and Joane Winchurst her mother executors and amongst other things did thereby give unto your Oratrix the sume of one hundred pounds to be paid unto her at her age of one and twenty years which said sume of one hundred pounds the said Robert Winchurst then had in his custody for the use of your Oratrix said father and mother and hath promised to pay since her death and further your Oratrix said grandmother did give unto your Oratrix by the said will the agreed (?) bedstead, feather bolters, bed clothes, curtains, pillows which stood and were in the Chamber or Sollar over the hall wherein she had which goods she did by her will appoint to be delivered unto your Oratrix when she should accomplish the age of one and twenty years and shortly afterwards your Oratrix said Grandmother died and her will was proved by your Oratrix’s said mother since her father’s death and your Oratix is entitled to have and receive as well the one hundred pounds as the said goods from your Oratrix’s mother for that your Oratrix hath atteyned her age of one and twenty years But now soe it is may it please your that the said George Winchurst and Humphry Jeston combining and confederating themselves together with Joyce the late wife and relict and Executrix or Administratrix of the said Richard Walden late one of the executors of the said Robert Winchurst which said Joyce hath gotten a great part of the estate of the said Robert Winchurst into her hands and custody and with the said Joane Winchurst your Oratrix mother the said confederates do now utterly refuse and deny to come to any accompt with your said Orator and Oratrix for that part of Robert Winchurch’s personal estate which belongs to your said Oratrix Mary and to deliver the same to your said Orator and Oratrix and doe alsoe deny and refuse to pay them the said hundred pounds and deliver the said goods soe bequeathed to your Oratrix by the said Amy Baker her Grandmother and which were also appointed to your Oratrix by her late father’s personal estate which your Oratrix as alsoe those goods which were given to her by her Grandmother and soe appointed to her by her late father .And your Oratrix her said mother pretends(?) that the Executors of her husband are possessed of all his estate and all the said goods of Amy Baker and that they ought to deliver them and to pay the one hundred pounds and the said executors refuse to doe it sometimes pretending that the debts and other legacies of the said Robert Winchurst are not yet satisfied and that they have noe assets of the said Robert Winchurst’s personal estate to satisfy the same at other times pretending that in regard to your said Orator and Oratrix did intermarry together without the consent of Robert Winchurst his Executors under their hands and seals your said Orator and Oratrix have not right or title to any part of the said Robert Winchurst’s personal estate at other times also pretending that they cannot safely part with any part of the said Robert Winchurst’s personal estate to your said Orator and Oratrix or dispose thereof for their benefit and advantage without the decree of this Honourable Court for their indemnity therein, whereas your Orator or his father on his behalfe is and will be ready to convey and make over lands for the benefit of your Orator and his wife and children of value answerable to the portion whereby the intention of the will of the Testator will be fully complied with howbeit they doe refuse to harken to the same or in any sort to performe the trust in them reposed all which doeing of the same confederates and contrary to right, equity and good conscience and to the great wrong and prejudice (?) of your said Orator and Oratrix In tender consideracion whereof and for that your said Orator and Oratrix have noe remedy at or by the rules of the Common Lawes of this Kingdom to be relieved in the promises (?) or to compel the said confederates to come to any accompt with your said Orator and Oratix for the said estate or to enforce them to pay and deliver the same to your said Orator and Oratrix to dispose thereof for their benefit and advantage but your said Orator and Oratrix are onely and proply to be relieved in equity before your Lordship in this Honourable Court . To this end therefore that the said Confederates may sett forth and declare upon their corporall Oathes whether the Robert Winchurst and Amy Baker did not make their severall last wills and testaments in such a manner and to such effect as is herein before sett forth and may alsoe sett forth by their answer a true and perfect inventory of all the said Robert Winchurst’s personal estate and the exact particulars and true values thereof and in whose hands the same or any and what thereof is or hath been disposed of and to whom by name and by whom and for what and may alsoe answer all and singular other the promises and that all the confederates may come to an accompt with your said Orator and Oratix for such part of the said Testators personal estate as belongs to them and alsoe may pay the legacie given by Amy Baker’s will and deliver the said goods and your said Orator and Oratrix may be relieved in all and singular the promises according to equity and good conscience. The link with the Navy was renewed in Nelson’s time, as Andrew McCumiskey has pointed out. A Joseph Winchurch served on HMS Neptune during the Battle of Trafalgar. e.g. : 1698 15 January, Humphrey, the son of Thomas Winchurst, naylor and Elizabeth his wife. between the house and land late of Roger Bolton and the house and land of William Winchurst. After her decease my house etc where I now dwell to my s Thomas W and the heirs male etc. and for want of such to my s John and heirs for ever. House where Richard Holmer dwells to wife to be sold for payment of debts. Note 2: There is an anomaly here, since John’s only recorded marriage was to Ann Freeman. Jane may have been his second wife. Enlightenment sought ! who was one of the sons of Humphrey W formerly of Dudley aforesaid Nailor decd. all of which said premises are now in the posssesion tenure or occupation of the said W.W.
(The property (“burgage tenament”) usually, and distinctly, consisted of a house on a long and narrow plot of land, with the narrow end facing the street. Rental payment (“tenure”) was usually in the form of money, but each “burgage tenure” arrangement was unique, and could include services. As populations grew, “burgage plots” could be split into smaller additional units. Burgage tenures were usually monetary based, in contrast to rural tenures which were usually services based. In Saxon times the rent was called a landgable or hawgable). I have puzzled about the parentage of John (who left the will) for some time. I don’t think he was the son of George and Ann. In fact, I think G & A moved to Abingdon. So there was definitely a John, eldest son and heir of Humphrey ? All of this is made more complicated by the movement taking place between Dudley and London (probably via the River Thames at Abingdon), so the mysterious Jane might have appeared there. At the moment, I don’t have the answer, but am open to suggestions ? It is worth remembering that this tree simply tracks the Winchurch line with wife named. My total of ancestors for around the year 1550 would be in excess of FOUR THOUSAND, even allowing for some inbreeding ! …and that is going back less than five hundred years, a relatively short period of human history. Notice that Thomas signed his name. This is the earliest ancestral signature that I have seen so far. Most likely this ‘childe’ was not Thomas son of Thomas, but possibly a child of Joseph. Joseph also had a wife called Elizabeth, so at a time of high infant mortality, maybe an error was made in the parish Register and thus copied to the Bishop’s Transcript. 1715 was in any case fairly late for Thomas and Elizabeth to have had a child ( they married in 1694 and there is no record of births to them after 1708) and the fact that the burial is of ‘a childe’ rather than ‘son of’ suggests the death of an infant (as was the case in 1706). In 1734, Thomas Winchurch SENIOR was buried, implying that he had a living son called Thomas. Anyway this Thomas and Hanah produced nine children between 1731 and 1742, so he must have existed ! I did wonder if one of the ‘London Winchursts’ might have returned to Dudley, but Thomas Winchurst b c 1695, the most likely candidate, was the one who was executed ! So, 1708 seems the most likely birth year for the Thomas Winchurst who married Hanah Benson. Thomas and Hannah’s third child, Thomas, born in 1734, married Phebe Jewkes in Dudley in October 1756. It is from this union that most present day Winchurchs descend. On 9th July 1780, Paul Winchurch (b 1759) married Sarah Shaw. They had eight children, five boys and three girls. The eldest son, Thomas, born in 1787, married Mary Holt in Dudley 1808 and they had two daughters, both called Sarah (the first Sarah dying in infancy) Mary died in 1812 and eight years later, widower Thomas took as his second wife widow Ann Shakespeare. Ann had been married to Joseph Shakespeare, so this was not her maiden name, which was possibly Brooks. Joseph Shakespear married Ann Brook at Clent on 24 Nov 1812 Could this be her aged 19 ? Until the 19th century, Rowley church was a chapel of ease belonging to the parish of Clent. The distance between the two (some 9 kilometres) gave rise to much inconvenience, particularly with the growth in the population of Rowley. They were separated by a Private Act of Parliament in 1841. Before this the Vicar at Clent was prone to insist that Rowley people went to him at Clent for a marriage rather than him going to Rowley to perform the service. Clent was a good long walk away and some people chose to “live” in Halesowen parish and get married there rather than go to Clent. All of this points to Ann being Brook(s) who married Joseph Shakepear and then as a widow married my GGGrandfather Thomas Winchurch at Tipton on 25 March 1820. This union produced four children, Thomas, William, Ann and Benjamin and it is at this point that registry entries start to become part of family memory, because Benjamin was my Great Grandfather. 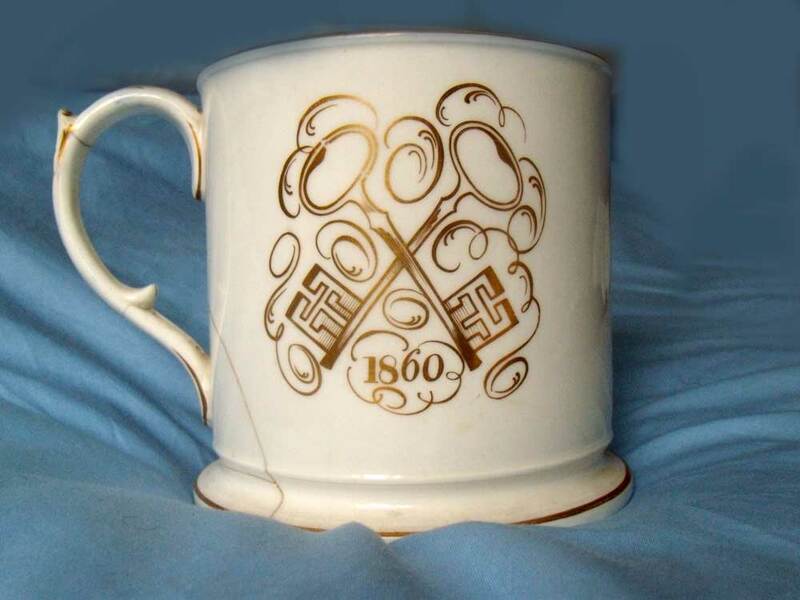 Benjamin Winchurch’s two pint mug with the Cross Keys logo, dated 1860 and ‘Windsor’ incorrectly spelt ! He was born in Birmingham in 1829 and christened on 1 January 1830 at St Philip’s Birmingham. In 1861 he married Ellen Eliza Tester in London. A glassblower by trade, Benjamin and Eliza lived at the Cross Keys in Upper Windsor Street in Aston. The landlord of this public house was firstly Thomas Winchurch. Benjamin’s father and when he died in 1856 Ann, Benjamin’s mother became landlady until her death, of ‘Old Age’ (she was 82) in 1875. Percy, my Grandfather, their second youngest of eight children became a life long teetotaller because of witnessing as a child, the effect that alcohol could have on the way people behaved. Roland is at the bottom; then Percy; Charles; Benjamin and Harry. The elder two brothers, Frederick and Albert are not in the picture, nor is Alice Ann Winchurch – the only girl. 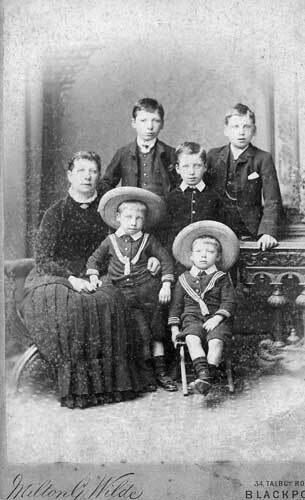 Family photo of the Winchurch brothers; dated 1886. 3 ) Frederick William b.12 March 1868 died 1950. He married Jennie Twist. They had two sons and three daughters. 4 ) Harry Edgar b.11 June 1870. 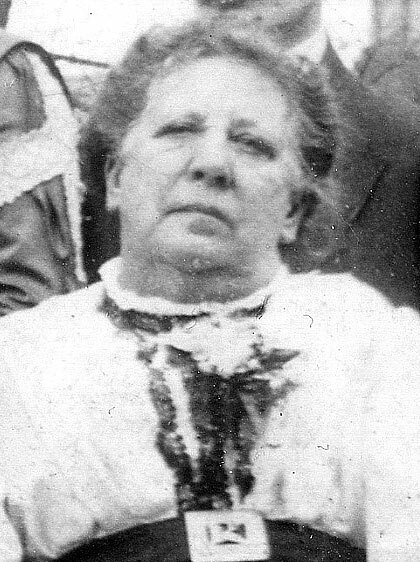 Married Clara Elizabeth Goodyear on 5 July 1896.They had one daughter. 6 ) Charles Herbert b. 23 November 1879 and died in 1909. He married Amy Eastwood ( Lizzie’s sister ). They had two sons. 7 ) Percy Walter b.15 April 1882 d. 9 September 1953. He and Marion Brown married 10 April 1911. They had one son Francis Victor and one daughter Jeanne Marion. 8 ) Roland Victor b. 14 April 1883 d.1955. He married Alice Wood . They had one son and three daughters.